Fitting a flue liner into a chimney for a woodburner or stove. We explain how to fit a flue liner into the chimney and insulate it with vermiculite. This DIY project includes pictures of a real installation of a wood burning stove. Fitting a flue liner into an existing chimney can certainly be a DIY job but certain, very important rules have to be adhered to. Any work done to an existing chimney needs to comply with the Building Regulations. In particular Approved Document J. This document can be downloaded from our projects pages. 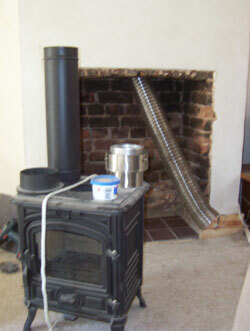 The size of the flue used depends on the size of the flue outlet on the woodburner. The flue used must, under no circumstances, be smaller than the flue outlet of the fire or stove. For a wood burner or other solid fuel fire or stove producing up to 30KW a 150mm flue must be used. For an appliance (burning smokeless fuel only) producing up to 20KW, a 125mm flue can be used. The amount of soot deposit created by a woodburner is quite considerable and a 150mm flue is suggested in every case. If you open up an old fireplace and would like to place a wood burner in the opening you must first arrange for the chimney to be smoke treated to see if it is safe to use without a liner. If the flue needs a liner, check with your supplier as to the best liner to use under your circumstances. A flexible liner is the easiest to fit. Please make sure you stay safe while you are working on the roof. Proprietary scaffold and roof ladders must be used and under no circumstances should you attempt this job on your own. It is a two person job. First, clean the chimney. You will regret not having done this when you start work. Chimneys accumulate a lot of soot and this may be dislodged at any time during the installation of a new liner. When it is, the entire room will be covered ! Now tie a large knot in the end of a rope (preferably a 10mm nylon rope) and lower it down the chimney to the hearth at the bottom of the fireplace. Tie the other end of the rope to the chimney pot. It is heartbreaking having spent ages getting the rope all the way down only to watch the other end disappear as well! If you feel the rope go slack before it hits the hearth it has probably got caught on a ledge or a change of direction in the stack. Lift and drop the rope a couple of times to allow it to fall down. When the rope is at the bottom, tie a piece of string to the top at the top of the pot or mark it in some other way. The distance between this mark and the knot that the end of the rope is the length of flue liner you need to buy. You also need to measure how wide and long your stack is so you can order a closing plate. The closing plate should overlap the inside edge of the brickwork by about 25mm leaving 75mm of brickwork exposed all the way round. Having obtained your liner you now need to remove the chimney pot and the surrounding haunching. If this is done carefully you will save the pot. Place the pot somewhere safe and squash flat the last 9 inches of the liner and fold the flat section back on itself. Push the rope through the fold as shown in the diagram and tie it together under the fold. Now use some strong duct tape and tape the folds together. Put plenty of tape on the actual crease of the fold itself to smooth off the sharp edges. You will soon be pulling this liner down the chimney and the more times it gets stuck (and we promise it will get stuck!) The more you will wish you had "wasted" a bit more tape rounding off the end. Now tie a large knot in the other end of the rope and once more drop it down the chimney. When it gets to the bottom get your work mate to pull it through while you feed it into the hole from the top. when it gets stuck, pull it up a little and tug it down again. Very few chimney stacks are straight up and down so there may be a few bends to work through. You should now go to our project on fitting a woodburning stove or fire. The image on the right shows the liner hanging down out of the chimney. Flue liner is not the cheapest of materials but do not be tempted to cut costs by being too accurate with the length of liner required. Admittedly there is a little too much showing here but it is so much better, and ultimately a great deal cheaper, to cut some off than it is to be 25mm short. Talk to your supplier about insulation for your flue pipe also. It is a long way from the wood burner to the chimney pot and as the hot smoke rises it will cool down on the metal of the liner. If the liner is not insulated the hot air could condense causing a lot of water to run back down the liner into your stove. This makes the stove or fire totally inefficient. The insulation (if loose vermiculite is used) must be tipped in from the top so it cannot be done until the register plate is fitted. With Gel Fires There's No Need For A Flue Liner!